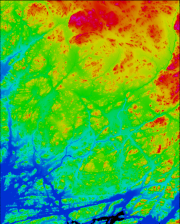 Digital elevation model (DEM) is often used as a generic term for Digital Surface Model (DSM) and Digital Terrain Models (DTM). In most cases a Digital Terrain Model represents the bare ground without any objects like buildings and plants on it. Digital Surface Model on the other hand represents the earth's surface and includes all objects on it. Both of them have their uses in numerous applications: extracting the shape and elevation differences of the earth's surface, modeling the flow of water or movement of masses (landslides or avalanches), engineering and infrastructure design, geomorphology and physical geography, gravimetric measurements, visualizing the earth's surface in traditional maps, 3D maps and models, 3D flight planning and flight simulation, line-of-sight-analysis, noise modeling, signal strength modeling, precision farming and forestry, flood analysis, intelligent transportation systems (ITS) and Advanced Driver Assistance Systems (ADAS), to name just a few examples. Laser scanning is a fast, accurate and cost-effective way to gather data used to create DEMs. When measuring a large area, airborne LiDAR from an aeroplane or a helicopter or even from an unmanned aerial vehicle (UAV) is usually the best method. For roads, railways and other corridor-like structures a mobile LiDAR system mounted on a car, train or other vehicle provides a more detailed point cloud from the nearest surrounding while a helicopter flight using an airborne system produces data for a wider corridor in a faster way. Laser scanning provides a 3D cloud of points that are classified by TerraScan as ground and non-ground points. TerraModeler creates a DTM from classified ground points and offers a variety of tools for visualizing and editing the model. Buildings and other high objects can be classified from laser points and added to the model to create a DSM.